It was sheer fate that first led me to fish the pristine waters of the Cobourg Peninsula back in 2011… and I’ve been working on getting back there ever since. Spoilt for choice between reefs, rocks, estuaries and flats, it was difficult to choose what to focus on when we sat down together at each evenings tackle preparation session. This hidden gem at the very top of the Top End is a tropical bluewater fishing paradise—and we want to share it with you! Hugh (our host and guide for this adventure) and I discuss the lay of the land during my first visit to Cobourg in 2011. At the very top of the Northern Territory, the Cobourg Peninsula thrusts into the Arafura Sea—it’s red, rocky cliffs standing defiant and proud under the scorching sun. The contrast in colour is really striking and unlike anywhere else we’ve fished. Garig Gunak Barlu National Park (pronounced Gah-rig Goonuk Bar-loo) encompasses the entire Peninsula, the surrounding waters of the Arafura Sea and Van Diemen Gulf, and some of the neighbouring islands. This relatively small national park is pulsating with life, demonstrating the great job it’s doing in protecting rare species, including the dugong and six marine turtles (loggerhead, hawksbill, Olive Ridley, leatherback and flatback turtles). Pristine white sandy beaches, colourful cliff-lines and sparkling blue waters that absolutely teem with life make this one of the most spectacular fishing destinations you are likely to come across. So, what would it take to make this the ultimate fishing adventure? Get used to this tranquil setting… it’s the home of our evening Tackle and Technique Clinics. Was there ever a more inspirational classroom? To qualify as an “ultimate” fishing adventure, this needs to have something out-of-the-box, right? Well, it does! This is not just any old fishing trip… if you join us for this four day, fun-packed foray into some of the country’s most isolated waters, you’ll be joining the inaugural Tropical Bluewater Masterclass, where the cliff-top, outdoor sunset bar will play host to bluewater fishing clinics, with unparalleled opportunities to pick my brains about all things tackle and tactics. 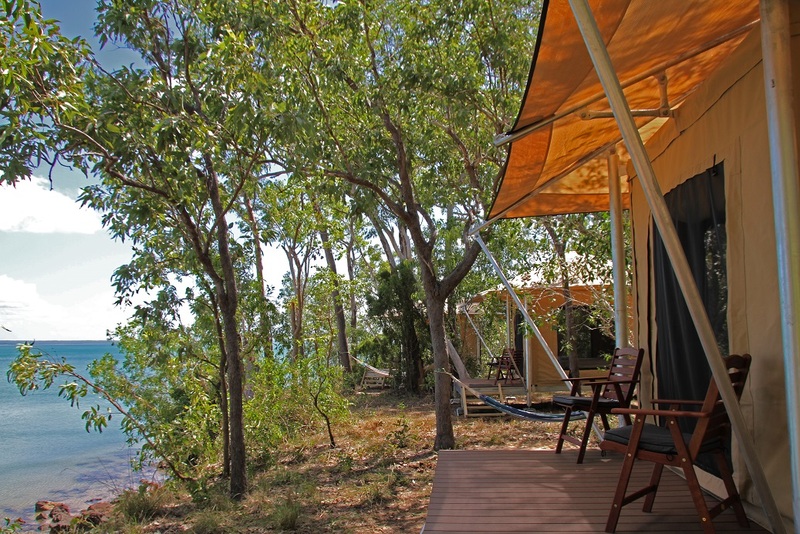 Cobourg Coastal Camp is a unique safari-style camp nestled amongst savannah bushland overlooking the bay of Port Essington. This unique safari-style camp is nestled amongst savannah bushland overlooking the bay of Port Essington on the northern coast of Garig Gunak Barlu National Park (Cobourg Peninsula) in northern Arnhem Land. The safari-style camp is nestled amongst bushland and overlooks the bay of Port Essington, your fishing playground for the next four days. You’ll enjoy the creature comforts of home, while still feeling close to nature at all times, thanks to the Camp’s innovative and ingenious layout and design. The central open-plan dining area is a relaxed place to enjoy meals and a chat, while the quaint safari-tents boast first class single beds… perfect for a comfortable nights’ sleep after a day leaning over bent rods. Wallpaper and splash backs give way to the wilds of the Aussie bush. You’ve never felt as close to nature as you will on this fishing safari! But the piece de resistance is surely the amenities, with Livistona palms playing host to hand basins and mirrors, while all shower rooms are cleverly screened for privacy whilst allowing you to shower in the Aussie bush. Even the toilets all have their own, unique views! Whichever way you’ve chosen to arrive (fly in or drive in… more on that later), you’ll be greeted by the resident camp caretakers and served nibbles on the cliff top, where you can stretch out and relax as the sun sets over Port Essington. Inner spring mattresses, private balconies and sunset views from every safari tent… now THAT’S camping in style! Foodie? Me too! And there’s nothing better to adding to the table. You might even like to take a camp cooking lesson. The whole box and dice. With more than 250 species of fish and over 2,000sq km of Marine Park to explore, the Cobourg Peninsula is the ideal fishing destination. A myriad of fishing options are available all within Port Essington, meaning we have maximum time fishing and minimum time travelling! The Parks wide variety of marine environments allows us to target a plethora of fish species using different fishing techniques. Mangrove lined creeks and gutters offer productive barramundi and mangrove jack fishing, though it’s the blue water action that draws most keen anglers to the area. Clearly, this is why we have chosen it for our Tropical Bluewater Masterclass! Rocky pinnacles and headlands provide great feeding grounds for both pelagic and reef dwelling species. Trolling, jigging and bait fishing are all effective techniques for catching Spanish mackerel, giant trevally (and a surprising number of other trevally species), queenfish, tuna and cobia. Further out (although still in the bay) are a number of coral reefs and rocky ledges that provide excellent opportunities for catching all the highly desirable tropical table fish, such as black jewfish (northern mulloway) , coral trout, golden snapper (fingermark), saddle tail snapper (nannygai), stripeys (Spanish flag), red emperor, various cod and even sharks. As if all that weren’t enough, my first visit also revealed some amazing tidal sand flats that just might be home to some of the most exciting “skinny water” sight-fishing in all of the Top End… Golden and diamond trevally, giant herring, queenfish… and almost certainly the elusive and highly-prized Indo-Pacific permit. They’re all there… So, are you up to helping me uncover the potential of these little-known and lightly-fished flats? Heavier rods and reels are catered for, but you can bring lighter gear if you choose. The tackle supplied by Cobourg Fishing Charters is all high quality, well-maintained and comprises mostly modern, reasonably heavy gear, but you are also welcome to bring your own favourite outfits! These are details we can discuss with you as we help you plan for your trip. Our guests will receive special “mates rates” at the famous Fishing & Outdoor World tackle shop in Darwin, along with a Tropical Bluewater Masterclass check list. The lads in at Fishing & Outdoor World are good friends of ours and have their finger on the pulse of what’s working where. They’ve promised to make sure you have everything you might need to ensure you’re on fire at Cobourg! We’re looking forward to sharing our fishing knowledge during this tropical adventure—not to mention the sumptuous meals and fun nights—with a small group of like-minded Aussie anglers. If that sounds like you, click here. Immersive Tropical Bluewater Learning Opportunity Like No Other! Can you imagine what it’s like to stand in an ancient landscape that is so isolated and protected that only 20 vehicles may enter its vast boundaries on any given day? Does the concept of sharing some 4,500 square kilometres of tropical outback Australia with just a handful of other people blow your urban mind? Well… if you think ’s hard to fathom, try imagining how untouched the even–more–remote waters of such a wilderness must be. It’s not stuff of yesteryear. It’s waiting for you next year… and the Starlings want to show you how to fish it! At the very top of the Top End lies a remote and rarely visited paradise called Garig Gunak Barlu National Park. Secreted away atop glowing red-ochre cliffs within the Park is the unique and unsurpassed Cobourg Coastal Camp, home-base for Starlo and Jo’s Tropical Bluewater Masterclass. Whilst the fishing is bound to be varied and spectacular—the rocky pinnacles and headlands provide great feeding grounds for both pelagic and reef dwelling fish including Spanish mackerel, giant trevally, queenfish and cobia, while further out coral reefs and rocky ledges attract golden snapper, coral trout, jewfish, saddletail snapper, stripeys, red emperor and cod—it’s the evenings and afternoons on terra firma that present the distinct point-of-difference between this fishing adventure and any others. It’s during these times that, cold beverage in hand, you’ll join the Masterclass Sessions: full access to some of the best fishing intelligence in Australia! Your questions, Starlo’s answers. Your rigging thoughts, Jo’s one-on-one demonstrations on how to make it happen. Insights into luring techniques that you can’t find in books… all with the backdrop of an ancient wilderness and an endless view across a crimson-kissed bay as the sun sets over the Arafura Sea. STEP 1: CHOOSE YOUR ARRIVAL OPTION. For those wanting to turn this fishing getaway into a no-holds-barred, immersive Top End adventure, this option is for YOU. 5 nights/6 days including 4 days fishing with a 2 day Top End driving adventure. DEPARTS Darwin-based hotel at 7am on 11 October 2017. RETURNS: Afternoon charter flight 16 October 2017 back to Darwin Airport. Departing Darwin 6.45 – 7:00am. Climb into your comfy Venture North 4WD and get set to wheel your way along the Arnhem Highway to the World Heritage-listed Kakadu National Park. Along the way, you will stop off at one of the Top End’s most picturesque fishing holes, Corroboree Billabong! This was Jo’s “backyard” when she lived in Darwin and still one of her sentimental favourites. No time for fishing today, though… but you’ll love it anyway. We’ve got you on a morning cruise, where you’ll have the opportunity to see an astounding array of birdlife, as well as awe-commanding saltwater crocodiles in their natural environment. The knowledgeable guide will ensure your cruise is both fascinating and informative, as they introduce you to all the inhabitants of this quintessential Top End billabong. Remember to take your camera with you… this is a spot of jaw-dropping beauty! After this first spectacular introduction to the tropical north, your drive will continue east on the Arnhem Highway to the historical Bark Hut Inn for a refreshment stop before entering Kakadu itself. Once inside the Park, you’ll leave the Highway and travel along the old Jim Jim Road, stopping at White Lily Billabong before arriving at Maguk (Barramundi Gorge). You’ll take a scenic 1km walk following the edge of Barramundi Creek to find yourself at the base of Barramundi Falls. This is your first opportunity to swim in a Kakadu waterhole. You can even snorkel in the large plunge pool below the falls and discover the surprising array of aquatic life that calls this ancient place “home”. The fun bus then heads for Nawurlandja Lookout in the late afternoon, where a short climb up a sloping sandstone path brings you out on top of an outcrop, with panoramic views of the sun setting over Anbangbang Billabong, Nourlangie Rock and the vast Arnhem Land escarpment. You’ll be forgiven for gasping. This vista took eons to create. Once the sun has set and the evening hues start to settle in, you’ll head for the township of Jabiru and on to Anbinik Kakadu Resort, your accommodation for the night. KAKADU JOURNEY DAY 2 Following breakfast, the Venture North fun bus will put Jabiru in the rear-view mirror and head to Cahill’s Crossing on the East Alligator River in the northern region of Kakadu and cross this crocodile honey-hole to take you into Arnhem Land. A 15km scenic drive to Gunbalanya Aboriginal community provides some of the best driving views in the Top End, with floodplains covered in bird life and water lilies running up alongside the Arnhem Land escarpment. Gunbalanya is home to the Injalak Arts and Craft Centre. Here, you’ll meet traditional local artists and watch them in action before departing with your local Aboriginal guide to explore the Injalak Hill art sites (some of the best Aboriginal rock art in Australia) before returning to the Injalak Art Centre to say farewell to these wonderful people. Next stop… Cobourg Peninsula. The drive takes approximately 3-4 hrs with stops and creek crossings along the way. The welcome you’ll receive at Cobourg Coastal Camp will be one you’ll remember for a long time — good ol’ fashioned Aussie bush hospitality! DEPARTING Darwin Airport at 4pm on 12 October 2017 ARRIVING Cobourg Peninsula approximately 5pm. OUT: Afternoon charter flight 16 October 2017 back to Darwin Airport. SKY TRIP Day 1 Make your way to Darwin Airport and join other guests aboard a private charter flight direct to the Cobourg Peninsula in remote northern Arnhem Land. The flight takes approximately one hour and provides extensive views of the Peninsula and surrounds. Upon arriving at Cobourg, you will be greeted by one of your guides, who will transfer you to Cobourg Coastal Camp… home base for your Tropical Bluewater Masterclass. STEP 2: CHECK OUT THE FISHING CONTENT! Awake to the sound of the tropical bush and enjoy a special ‘Cobourg-style’ cooked breakfast, before we hit the water for three days of blue water action. Typically, we will leave camp early morning and return for lunch, a cool down and a rest before heading back out for the afternoon catch. Actual fishing activities will be made at camp, with weather and tides playing an essential role in planning. There will be two boats, with four people per boat. It’s highly likely that each boat will participate in different fishing styles at varied locations on each session, with these rotating around through the trip. When the tides are not favourable for fishing, hunting mud crabs is on the agenda… after all, who doesn’t want mud crab on the menu? Cobourg has an abundance of mud crabs that can only be caught by spearing or hooking. On the lower tides, rocky ledges and mangrove flats provide the perfect conditions to spear crabs as they await the incoming tide. We can also shuck oysters from the reefs close to camp and add them to each evening’s seafood dinner! A refreshing shower with an unsurpassed and perfectly private bush view is just what the doctor ordered after each fishing foray. Then, make your way to the cliff top bar. Each evening will offer a Tackle & Technique Clinic or a free-form information session guided by you, cold beverages of your choice, fresh-made canapés and an twilight atmosphere like no other on Earth. Dinner will be served each night in the central dining hall… and the yarns and laughs will be many! Awaken to mixed emotions… sadness that today sees you fly home measured with anticipation and determination to make the most of your last day in fishing paradise! One last scrummy Cobourg-style cooked breakfast before a morning fishing trip… what will your boat elect to do? We’ll lunch on the water on this day, to maximize our fishing time before we bid goodbye to our friends at Camp and board our afternoon charter flight back to Darwin, where our hosted trip ends. Experienced fishing guides, allowing Starlo and Jo to simply “host”, mentor and (of course) fish! NOTES: Price is ex-Darwin. Airfares to and from Darwin are NOT included and should be arranged by you, at your cost. ***The 4 days fishing charter is included for the group (must be six guests travelling with us for the trip to proceed) – with two boats taking three guests each day. Groups will be rotated between boats, with Starlo and Jo each hosting a boat. You will get to fish with both of them at least a couple of times each, giving you maximum access to their individual and different expertise on each style of fishing.